1. Give an example of an irrational number________, a rational number _______, and integer_____, a natural number. 2. True or false: .121212… is a rational number. 3. True or false: Every real number is rational. 4. True or false: Every integer is rational. 7. is an example of the ______________ law of multiplication. 8. is an example of the ______________ law. 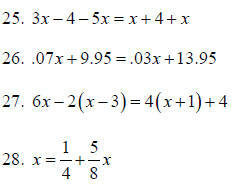 9. is an example of the ____________ law of multiplication. 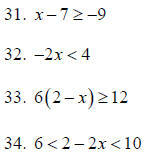 Solve the inequality. Write your answer as a set, in interval notation, and graph the solution. 3. A vertical line has slope _______ and a horizontal line has slope ________. 4. The equation of the x-axis is __________ and the equation of the y-axis is _____. 5. The equation for a vertical line through (2,3) is _______ and the equation for the horizontal line through (2,3) is ___________. 9. Find the equation for the line through the points (-1,3) and (3,1). 12. What is the domain of the function above? 13. What is the range of the function above? 14. If the function above is called f, what is ? 15. Every line determines a function except a ________ line. 16. Let with domain [-3,7]. What is the range of this function? 17. For the function above, what is ? (Partial answer: doesn’t exist because –4 is not in the domain of f.
18. The picture represents a function because it passes the ________ test. 19. If the picture represents the function f, then the domain of f is ______ and the range of f is _____. 22. For the polynomial the degree is ____, the leading coefficient is _____ and the constant is ______. 24. If you multiply a polynomial of degree 4 to a polynomial of degree 3 the degree of the product will be ____. 1. For the polynomial the degree is ______, the leading coefficient is _______, and the constant is __________. 3. 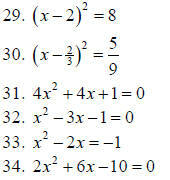 Rewrite the polynomial in standard form. 4. For the polynomial in number 3, the degree is _______, the leading coefficient is _______ and the constant is ______. 24. Plot the points above, and graph the parabola.